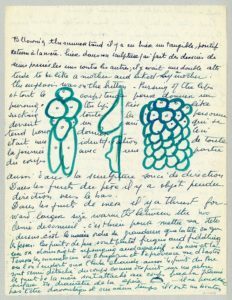 Original documents from Louise Bourgeois’ recently discovered psychoanalytic writings, as well as drawings and sculptures. Following its first showing in Latin America, Louise Bourgeois: The Return of the Repressed was re-imagined for the unique setting of the Freud Museum London, which was discussed as a venue by Louise Bourgeois before her death. Appropriately, in the final home of Sigmund Freud and his daughter Anna Freud, this exhibition explored the artist’s complex and ambivalent engagement with the theory and practice of psychoanalysis. Louise Bourgeois was born in Paris in 1911 and lived in the United States from 1938 until her death in 2010. She became one of the best known artists of the 20th century, whose work has inspired a rich commentary from academics and critics alike. What is not generally known is that she also undertook a psychoanalysis spanning three decades. The exhibition is based on the discovery of two boxes of writings by her longtime assistant Jerry Gorovoy at the beginning of 2004, and two more in early 2010. These constitute an archive of over one thousand loose sheets recording her reactions to her psychoanalytic treatment from 1951; several texts refer directly to Dr. Henry Lowenfeld, whom she saw from 1952 to 1982. In some cases these texts complement existing diaries that she kept throughout her life, while in others they serve to fill in the gaps for those years in which she did not keep a diary. The exhibition raised fundamental questions about the relationship between art and life, and the therapeutic nature of art itself. To curator Larratt-Smith, who has served as the literary archivist of the Louise Bourgeois Archives since 2002: ‘The discovery of the psychoanalytic writings has enriched and augmented our understanding of Bourgeois’s work and life immeasurably. They represent a distinct contribution to art history as well as to the field of psychoanalysis.’ The exhibition foregrounds the importance of these writings, displaying nearly fifty original manuscripts for the first time and ranging from sketches, notes, dream recordings, lists and drawings. Sculptures and drawings on display include pieces such as The Dangerous Obsession (2003), the woven fabric text I Am Afraid (2009), and drawings and four gouache on paper works from the 2007 series The Feeding. Janus Fleuri (1968), sometimes considered the most significant of all Bourgeois’s works, also came into Freud’s home. The exhibition was accompanied by a major two-volume publication edited by Philip Larratt-Smith. A selection of these private writings by Louise Bourgeois about her work, her family and her state of mind, appear here in print for the first time in English, complemented in the first volume with essays by Bourgeois scholars and prominent academics, including Philip Larratt-Smith, Donald Kuspit, Elisabeth Bronfen, Meg Harris Williams, Juliet Mitchell, Mignon Nixon and Paul Verhaeghe & Julie De Ganck. The exhibition was be accompanied by a comprehensive events programme, including a conference featuring some of the academic contributors to the catalogue. The exhibition was made possible due to the generosity of the Louise Bourgeois Trust, The Easton Foundation, Hauser & Wirth, Kukje Gallery, Cheim & Read and the Henry Moore Foundation.